With the latest version of Dragon Dictation for Mac, users of the speech recognition program no longer need to choose between talking and typing when creating documents in Microsoft Word. Dragon Dictation 2.5, unveiled Monday, will let them do both. In previous releases of the Mac productivity tool, users could dictate documents in the latest version of Word, but if they wanted to type as well, they first had to cache the document. The ability to talk and type simultaneously in Word has been available in Windows, so it's no surprise that Mac users would make that the most-requested feature for their version of the application. "What a lot of people do is choose to edit with their keyboard and use their voice to dictate," said Peter Mahoney, senior vice president and general manager of Dragon for software maker Nuance. The newly unveiled Dragon Dictate 2.5 lets users seamlessly alternate between talking and typing when creating documents with Word 2011. That ability already existed for some of OS X's built-in applications, such as TextEdit, and Mahoney says Nuance would love to expand the capability to other Mac programs as well. Monday's 2.5 release introduces other features and enhancements as well, most notably support for the Dragon Remote Microphone app for iOS devices. The iPhone app, released in June to support the Windows version of Nuance'™s voice-recognition application, turns your device into a microphone that you can use with the desktop offering. The mobile Dragon Remote Microphone app connects to your Mac over Wi-Fi. Once connected, your iPhone appears as just another microphone source to the Mac. Because the app connects over Wi-Fi, Mahoney says, the quality of the audio remains high; a Bluetooth connection requires some compression to take place, so accuracy can suffer in the process. You can post updates to Facebook and Twitter from within Dragon Dictate 2.5. 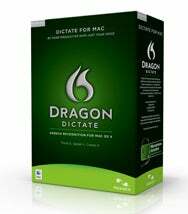 Dragon Dictate 2.5 is a free update for anyone who bought the 2.0 version of the speech recognition software. If you'™re using an earlier version, you can upgrade to the latest release for $99. Dragon Dictate costs $199. The software runs on Snow Leopard and later. That includes Mac OS X Lion, released by Apple last week. Nuance representatives tell me that there are no issues with running Dragon Dictate on the latest version of Apple'™s Mac operating system.